I'm back!!!! It's been a while since I've done a post on a project. But now that the holidays are over it's time to share all those Christmas presents that I spent all of December working on. My brother-in-law and his wife had a beautiful baby boy this past July. Since I don't get to spend a bunch of time with the new mom due to work schedules and such I really didn't know what to give her for Christmas. 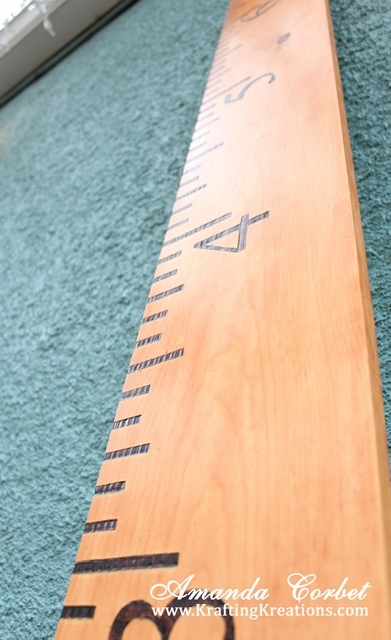 So I went stalking through her Pinterest boards and came across a pin of a giant ruler growth chart. It was so absolutely awesome and adorable! So I knew I had to make one for them. The funny part was, I showed my husband and he asked "why would you want that?". Then I had to explain to him the purpose of a growth chart. I thought everyone knew what a growth chart was. Although my parents just marked it on a corner of the wall in the house. But this one is better because you can take it off the wall and move it with you without having to re-do the marks! 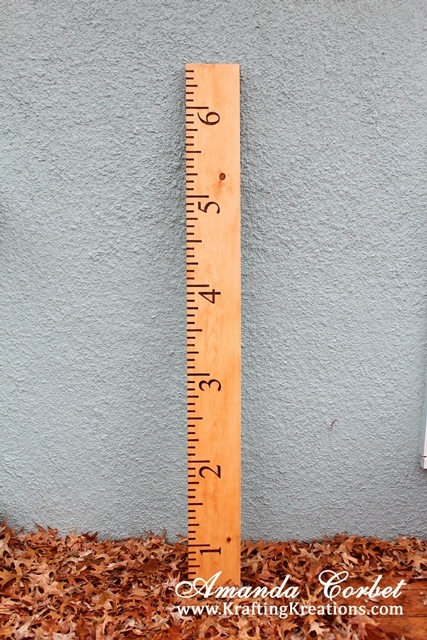 I started of by searching Pinterest and then Googled DIY Ruler Growth Chart and came across this tutorial at Wilder Do's. After getting lost on their blog oohing and ahhing over various projects I called it a day. It's such a huge relief to know what you're going to make. So I followed the tutorial and laid out the marks and numbers on a 1 x 8 that was 7 feet tall. I started off with the 6" mark and worked my way up. For the number templates I simply cut out some Times New Roman numbers that were 3" tall and cut out some stencils from card stock. I used the card stock stencils to trace the numbers onto the board. Then I used my wood burning tool with a chisel tip to outline everything. After much trial and error I found out that my soldering iron gets much hotter than the wood burning tool and that worked better and faster for filling in the lines and numbers. I know... 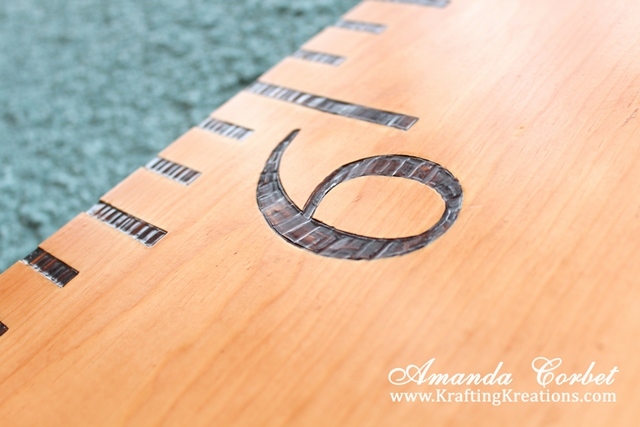 I could have just painted on the lines and the numbers, but I really liked the color and texture that the wood burning added. After everything was burned in I coated it with three coats of Minwax Polyshades in Pecan with a satin finish. I was running out of time so the fact that it was stain and polyurethane all in one step made it the go to product. Then it was just a matter of letting it cure completely and wrap it up. I even wrapped up the hanging hardware with it, so there is no excuse for not getting it hung up. 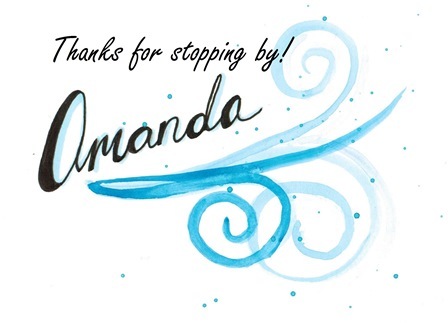 Thank you April from Wilker Do's for showing me how to make this awesome project! I will definitely be pinning and building some of the other projects you've shared!